Ten years ago today, the USA Hockey board of directors unanimously approved the launch of a new paradigm in youth athlete development: the American Development Model. The decision created a better way to play for American youth, dramatically improving the hockey development environment in the United States. The NHL became an early champion of the ADM, throwing its support behind the initiative. The ADM has since spread across the nation’s entire sporting landscape, as it was subsequently adopted by numerous national governing bodies, local youth sport clubs and the U.S Olympic Committee. 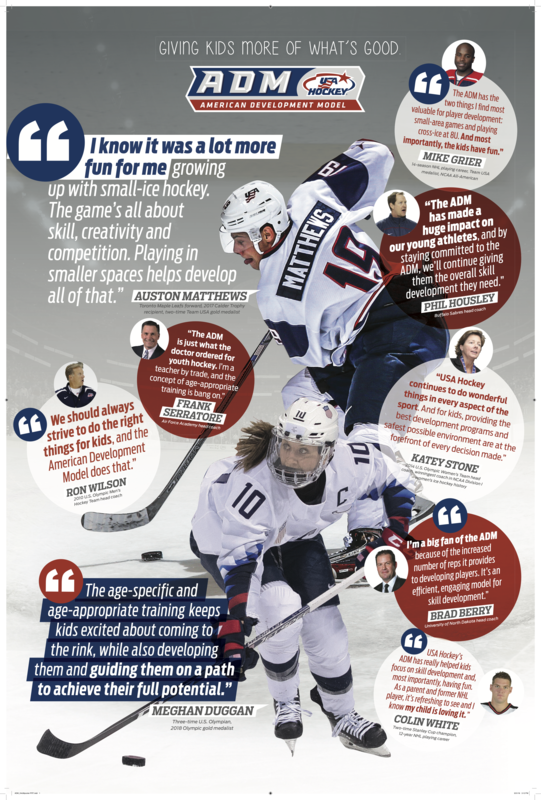 Blending the latest sport science with proven childhood development techniques and decades of high-performance hockey wisdom, USA Hockey’s ADM debuted in the 2009-10 season. Its age-appropriate, age-specific competition and training structure provided a nationwide blueprint for volunteer-led associations, coaches and hockey directors to create the best possible youth hockey experience, placing a heightened emphasis on skill, fun and long-term athlete development principles. To further support the initiative, USA Hockey embedded throughout the nation ADM regional managers with college and professional coaching experience who began working daily with local associations to help implement the model's high-performance structure. The total number of youth hockey players (ages 18 and younger) in America has increased 13 percent. The total number of 8-and-Under hockey players in America has increased 33 percent. The total number of 9- and 10-year-old hockey players in America has increased 15 percent. The total number of male hockey players (ages 18 and younger) in America has increased 15 percent, reversing an early-2000s trend during which nearly 40,000 boys left the sport. The total number of female hockey players (ages 18 and younger) in America has increased 37 percent. USA Hockey reversed an attrition trend at the 12-and-Under age classification, increasing the total number of players in that category by 7 percent. Player retention rates increased at the 10U, 12U and 14U age classifications. USA Hockey reached a record number of youth players in the last five consecutive seasons, and a record number of 8-and-Under players in the last three consecutive seasons. “It was a revolutionary concept at the time, but approving the ADM has done great things for American hockey and American youth sports as a whole,” said Pat Kelleher, executive director of USA Hockey. “It brought more children into the game, and just as importantly, it kept them in the game because ADM programming is more fun, more engaging and more efficient from a skill development standpoint. The U.S. has experienced unprecedented success at the IIHF World Junior Championship, winning four consecutive medals (including gold in 2017 and silver in 2019). The U.S. Under-18 Women’s National Team has won more gold medals than any other country. No country has won more medals at the IIHF Under-18 Men's World Championship than the U.S. The U.S. Junior Select Team has won more championships at the World Junior A Challenge than any other country. The U.S. Youth Olympic Men’s Ice Hockey Team won gold at the 2016 Winter Youth Olympic Games with ADM regional manager Scott Paluch serving as head coach. USA Hockey will commemorate and celebrate the 10th anniversary of its ADM throughout the 2019-20 hockey season.